Year after year, the man and the machine continued to evolve in a nearly streamlined path with dance music. After all, this was what spawned him in the first place. Dark nights in warehouses with a then ‘secret society’, whose only purpose was to hear pumping rhythms that were unknown and unheard outside the walls of this temporary musical sanctuary. A rave was a magical place and Kryoman became synonymous with the experience. At the core if his being, Kryoman is the very essence of electronic. A total and complete cerebral and emotional takeover, culminating in a synergistic explosion of aural and visual madness. The robot, as he has come to be known, takes revelers to a whole new realm of reality. He is the energy and the link that ties the artist with the audience, because, when the robot engages, he is channeling both. Kryoman dominates all factions of the dance music landscape performing nightly at festivals, clubs, and one offs across the globe. 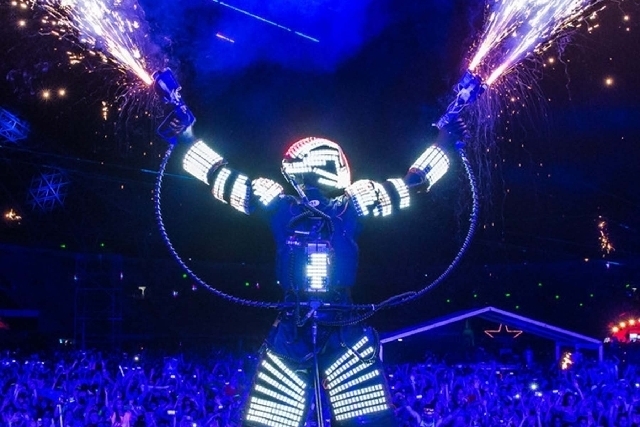 From his newly announced Vegas residencies, to his upfront appearances with the likes of Afrojack, Carl Cox, David Guetta, Sunnery James & Ryan Marciano and Hardwell just to name a few, Kryoman continues to aid the evolution of dance music by incorporating hyper-stimulating visual performance art into the mix.